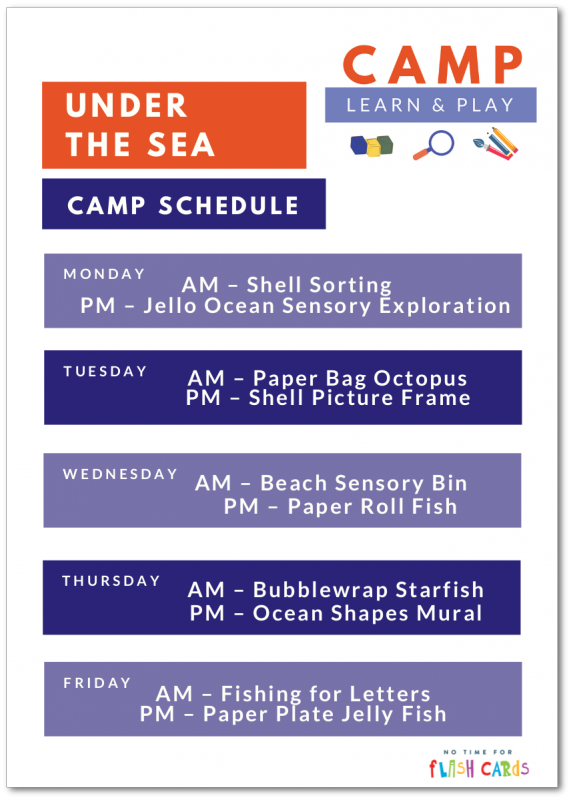 Camp Learn & Play this week takes us Under the Sea to learn and explore with some amazing sea creatures. Get your printable schedule and book list to make it easy to follow along, then scroll through the activities below for more details. Here is the printable schedule <– click the link to print. 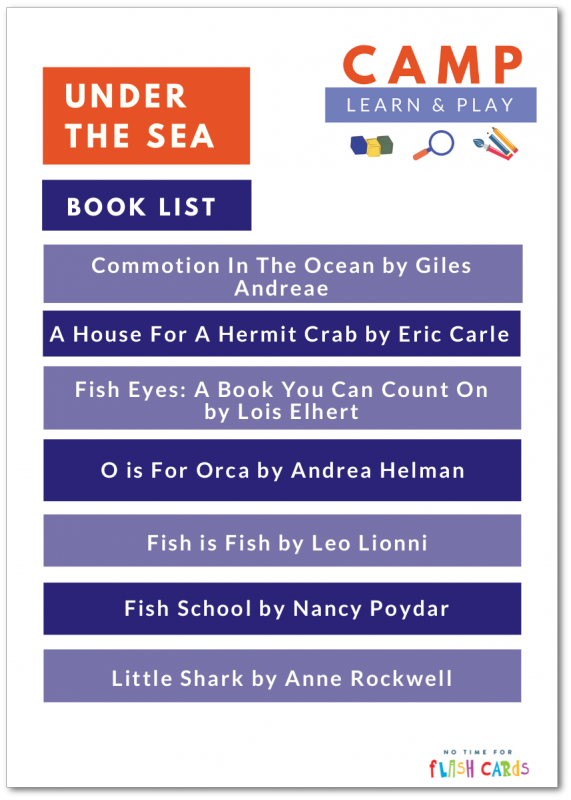 Here is the printable book list <— click the link to print and take to your library! You don’t need to buy expensive shells or live right by the ocean. Grab some from the dollar store and you are all set. A fun container is awesome but not required, plain old bowls will do in a pinch as well. Using tongs like these zoo sticks will boost the fine motor aspect of this activity, but there is something wonderful about sorting these shells by hand, feeling all the textures they offer. This takes a little time to set up ( definitely click through for the full step by step), but it’s so much fun, and you can play for days if it doesn’t get too hot. If it’s hot where you are, scoop it out of the water table at night and store it in your fridge. I am often asked where I got that water table so here is an affiliate link to it on Amazon. AM: Paper Bag Octopus. 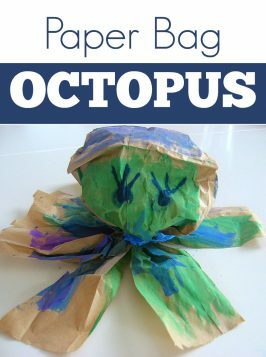 This lunch bag octopus might not look super snazzy but ripping and crumpling the paper that you stuff it with is GREAT for hand strength which is GREAT for handwriting. I don’t know too many kids who don’t need a little help in that area. Why not do it in a fun way? 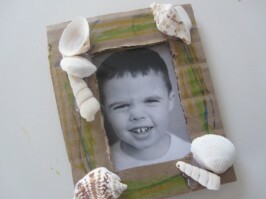 PM: Shell Picture Frame. 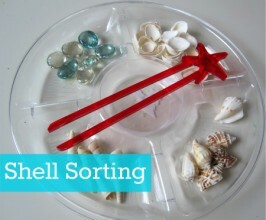 This uses some of those shells you sorted with yesterday and creates a great useful craft. I love the look of the cardboard with the shells, but you could use hot glue and pop the shells on a premade picture frame, heck you could even paint them first! That variation would be wonderful for older kids. 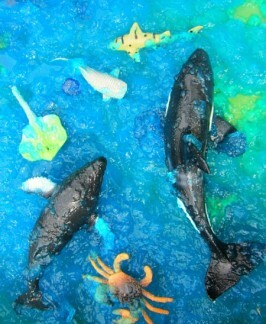 AM: Beach Sensory Bin. Again with the shells? Yes! I don’t want anyone to go broke buying materials. 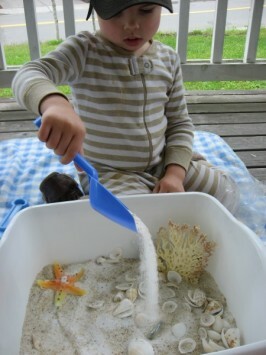 Grab some sand, a few inexpensive shovels, and a simple container and you have a beach sensory bin. 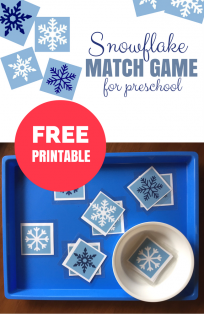 So simple and such a great calm activity for a busy summer. 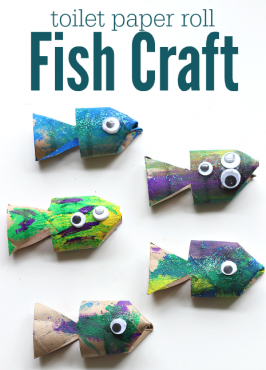 PM: Paper Roll Fish. This is fun and appeals to a wide range of ages, so it’s a great one to have older siblings join in on. 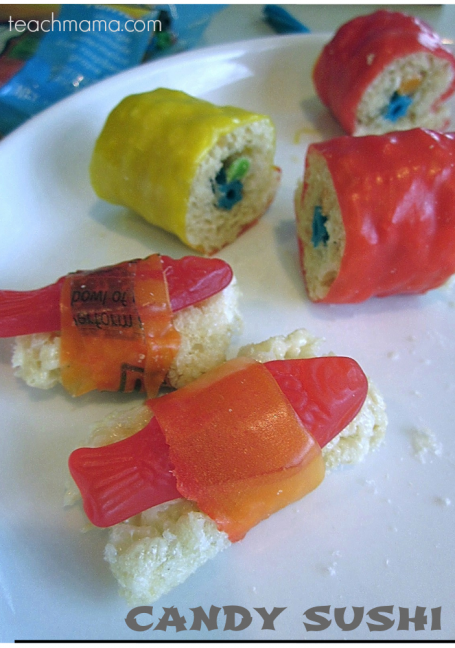 Toilet paper rolls get a brand new lease on life as totally awesome fish! A few strategic scissor cuts, googly eyes, and paint is all you need! AM: Bubblewrap Starfish. 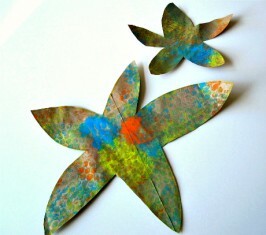 Printmaking is a great way for young children to explore different textures and how they affect their art. These starfish ( I should really say sea stars) are so fun to make! PM: Ocean Shapes Mural. 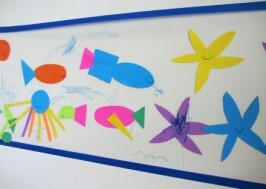 Use up your scrap paper and make shapes for your children to add to this mural and turn into sea creatures. They do not need to look “just right”. The goal of this activity is to create using shapes, become familiar with shapes and make something rad. Also, if you have more than one kiddo murals are a great way to co-operate. It’s hard to share space and giving kids a chance to work on something together is always valuable. 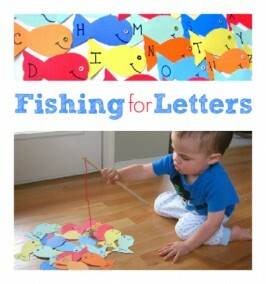 AM: Fishing For Letters! 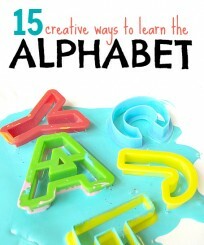 This is a classic for a reason; it’s such a fun way to work on becoming familiar with letters. Do not quiz your kids just model it when it’s your turn to fish. ” Look Mommy caught a letter f!” I have this on Friday so that you use it even when the week is over, as well as giving you time all week to cut out the fish! 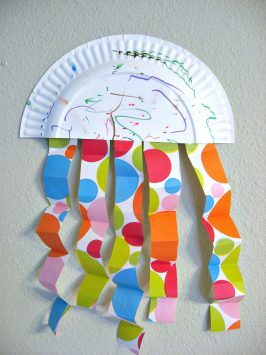 PM: Paper Plate Jelly Fish! I just made these with my students at the end of the school year, and they loved it. You can use wrapping paper for the tentacles or if you have leftover party streamers those work GREAT! Toddlers love using paint daubers because they are easier to hold than skinny little markers. 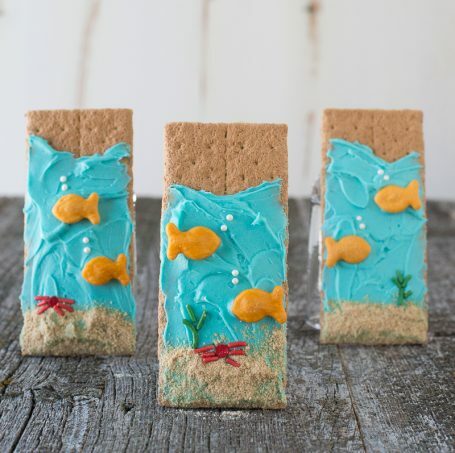 Here are some fun food ideas I found that you can not miss out on! 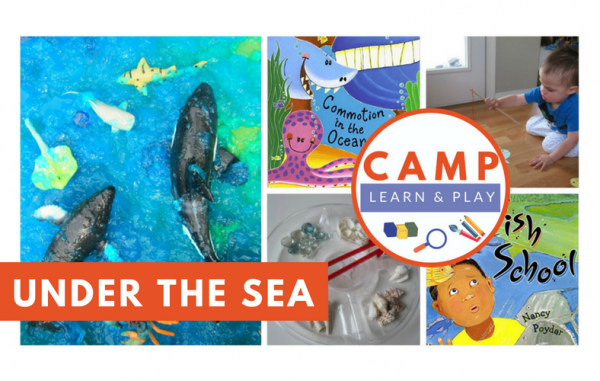 Find even more beach and ocean themed activities on my Camp Learn & Play Under The Sea Week Pinterest Board! 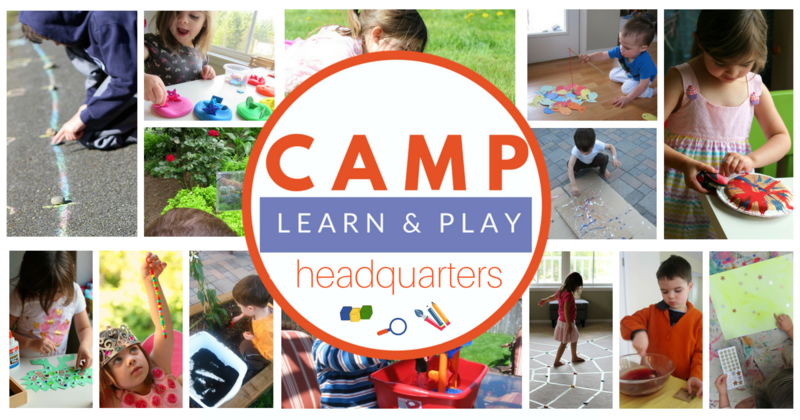 See all our themes and plan out an amazing summer at Camp Learn & Play’s HQ! This is AMAZING! I love the simplicity of your scheduling! One in the morning, and one in the afternoon… so simple! It makes me want to toss the plans I have for next week and do something like this! Thank you so much for all your hard work for this camp! I love it and I know my two little ones will, too!! Thank you so much for all your hard work preparing this camp! I’ve always loved your site, but this might be your best idea yet!! My four year old daughter and I have had a blast so far and we’re so looking forward to the rest of the summer. Thanks again! We are having so much fun with this camp! We are a week behind (I’ve got newborn twins and couldn’t get my act together last week), but we’re having a blast. The aquarium and abc fishing game have been favorites. My son was so excited to take his dad the the aquarium when he got home from work. Thank you for all your hard work! and especially big thank you for keeping it free. we wouldn’t have been able to do it otherwise and we would have been missing out. Thank you.